This winter Melbourne has been colder than usual. I'm finding myself more and more sitting inside and wanting to snuggle into the couch with a cup of tea. I'm definitely not complaining though, because I wouldn't have it any other way! I absolutely love winter and dread summer having to return with it's awful heat. With all my tea drinking and relaxing time I really felt like I needed something nice to snack on. We don't keep biscuits or cakes in the house, mainly because I don't have self-control when it comes to baked cookies, unless I make something. So I thought today it was about time I "treated" myself to something nice ... any excuse really!! 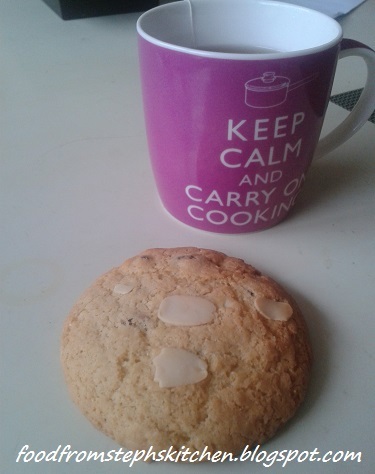 I adapted my Mum's choc-chip cookie recipe; where she got it from I have no idea! 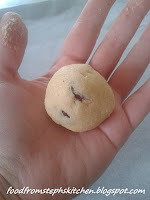 As I wanted a softer cookie, I added less flour to give it an almost cakey texture inside the crisp outside of the cookie. The dough is a little bit more sticky to work with, but the end result is delicious and worth the sticky fingers! ... now that I've made them, I really don't know how long they will last!! Before you forget - pre-heat your oven. 180 C or 356 F in a fan forced oven. In an electric mixer or with electric beaters, cream the butter/margarine with the sugar as you would for the start of any cake. Add your vanilla and egg and beat well. For this next bit you could continue using the beaters, but I find that it's just easier with a wooden spoon. Add your salt followed by your flour bit by bit, mixing it through completely before adding more. I do it this way as I find it easier to incorporate the flour little by little rather than all at once. Lastly, add your cranberries and almond flakes. You don't have to use the almond flakes, you can even just crush some almonds (or even some macadamia nuts) and add them. I added 60g of cranberries and 30g of nuts, but I didn't want too have too much in the cookies. It's really up to you, so make it how you want them! Line a baking tray with grease proof / waxed baking paper, and take some dough and roll it into a large ball. The ball should fit nicely in the middle of your palm. If you'd like small cookies simply make a smaller ball. For this recipe I made large ones. Flatten the ball slightly in your hand a couple of times before placing it on the tray. Continue with the rest of the mixture, making sure you leave enough room between the cookies as they will grow about 2-3 times bigger. 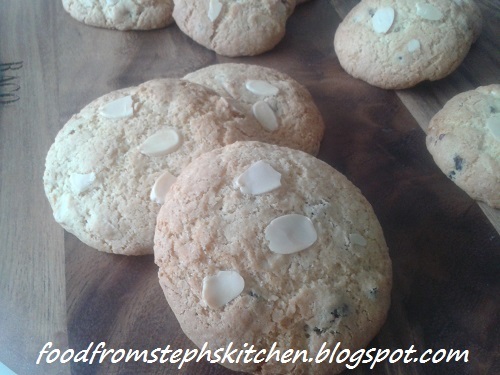 Before popping mine into the open I placed a couple of almond flakes on top, but you don't have to of course! Now, make a cup of tea while they cool momentarily ... then eat! Thanks so much for linking up to Creative Wednesdays, Steph! :) I love the idea of a cookie which is soft and cake-like on the inside and crispy on the outside.